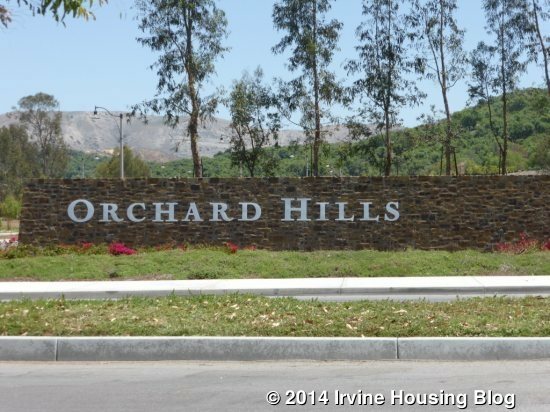 After many years of waiting, Orchard Hills finally debuted 12 new sets of models this weekend. The neighborhood is split into two parts Orchard Hills and a gated community known as The Groves at Orchard Hills. This week, I will present an overview of the non-gated side, located within the Culver Drive/Orchard Hills Drive loop. Over the coming weeks, I will present the five sets of models within this neighborhood, as well as an overview of The Groves and the seven sets of models on that side. 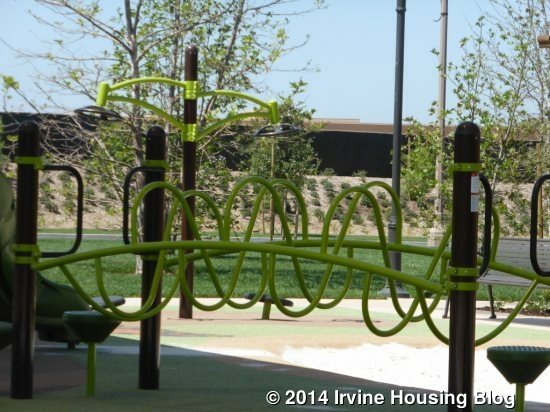 Entrata, Vista Scena and Corte Bella are all part of the Irvine Unified School District. Students will attend Canyon View Elementary School, Sierra Vista Middle School, and Northwood High School. 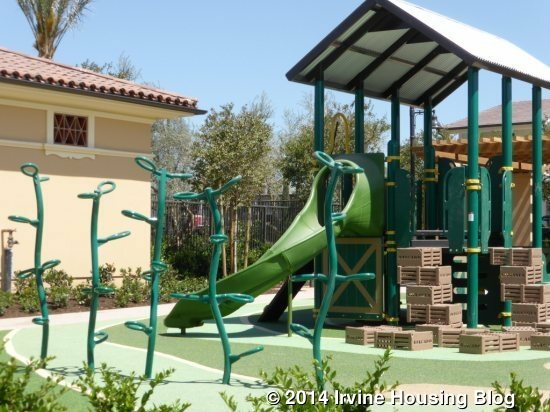 Terrazza homes are all in the Tustin Unified School District. Currently, students will attend Hicks Canyon Elementary School from kindergarten through fourth grade, Orchard Hills School for fifth through eighth grade, and Beckman High School. 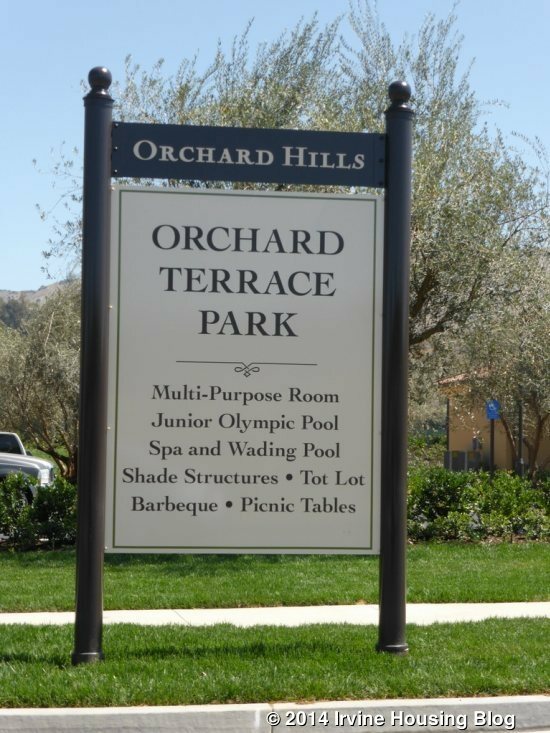 However, Orchard Hills School is officially designated as a K-8 school, so as the population of the neighborhood grows, students will likely attend Orchard Hills beginning in kindergarten and will not be slated for Hicks Canyon. The Strada neighborhood is split between the two districts, so buyers should make sure to discuss the schools with the sales office when purchasing a home. Buyers should consider talking directly to the school district offices to ensure that they receive correct information regarding school designations. All of the homes in these collections are two stories, though some models in Entrata have only the garage downstairs with all living areas upstairs. In the Entrata collection, one model has a downstairs bedroom. None of the models in Vista Scena have a downstairs bedroom. In Corte Bella, Residence One has all bedrooms upstairs, Residence Two has the master downstairs and the other two bedrooms upstairs, and Residence Three has a downstairs bedroom with the master and two additional rooms on the second floor. Both Terrazza and Strada have a downstairs bedroom in every model. This side of Orchard Hills is home to three parks. 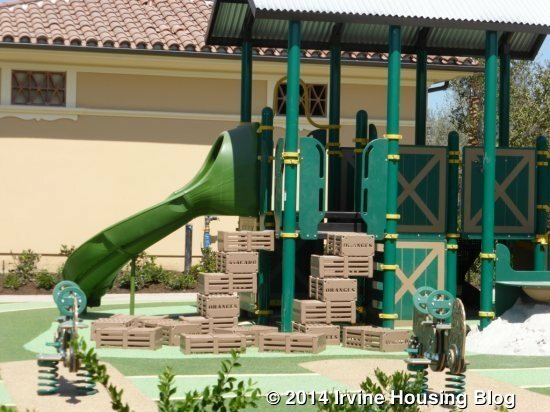 The smallest one, Bella Garden Park, isn’t built yet and will be located near the Corte Bella homes. 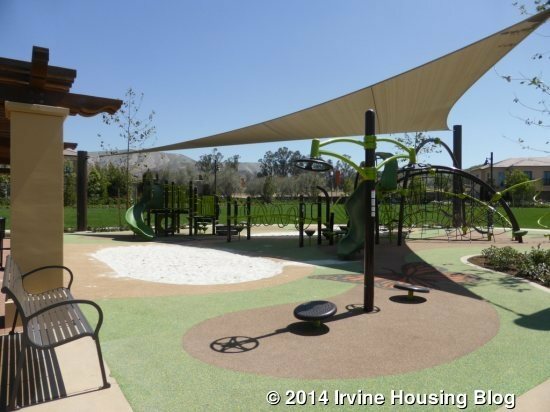 This park will only have shade structures, picnic tables, and barbecues. The other two parks are already built and I think they will be very appealing to residents. Though they are designated as being exclusively for the use of residents in these five collections, the playgrounds aren’t gated. 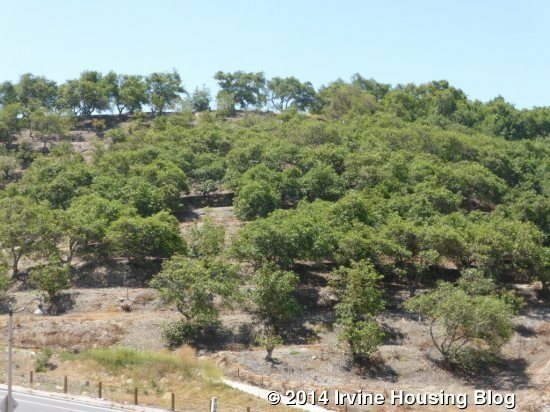 In addition to the parks, these homes surround the existing avocado trees and many will have nice views of the orchards. Some homes will even have views that stretch to the ocean on clear days. 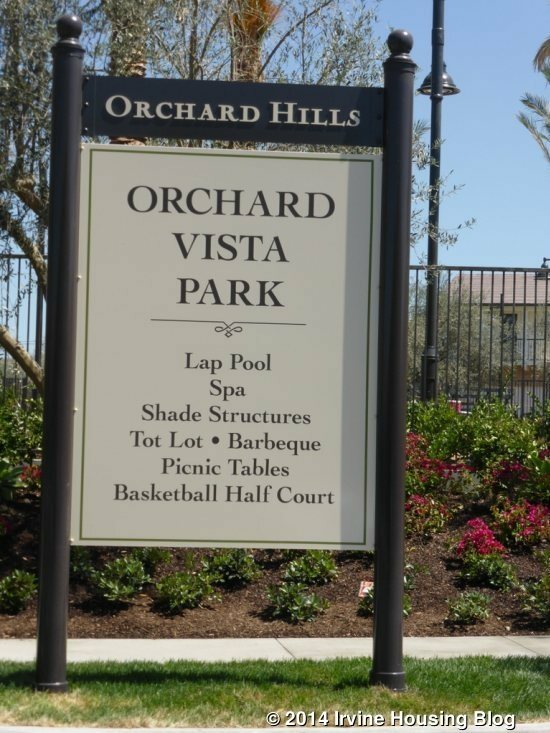 Orchard Vista Park sits at the front of the Strada neighborhood. It has a tot lot and half basketball court. 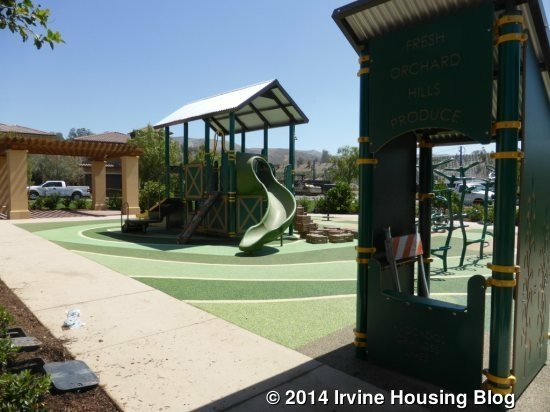 The playground is very cute and is designed to embrace the area, featuring climbing structures that resemble farm crates and trees, as well as a pretend produce stand. Most of the area has a rubber play surface, though there is a small sandbox. Inside the gated area, there is a large lap pool surrounded by a spacious patio area. The spa is tucked into a corner behind the pool. 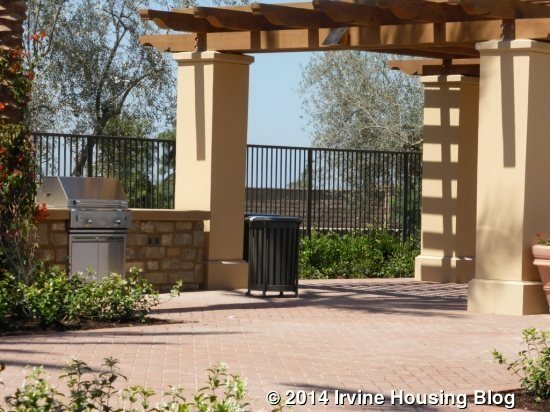 The patio has shade structures, community barbecues and picnic tables. I didn’t notice any barbecues outside of the pool area. Orchard Terrace Park is a little farther up the hill, in front of the Entrata homes. This larger community area features a tot lot with barbecues, shade structures, picnic tables and a large, grassy lawn around it. 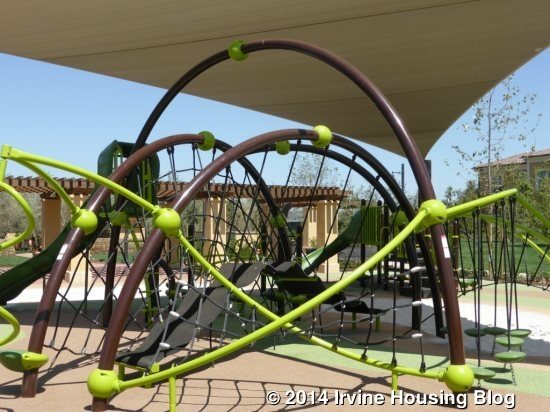 Children who love to climb will be in heaven at this park, where the avocado-colored play structures include large, web-like climbing structures. 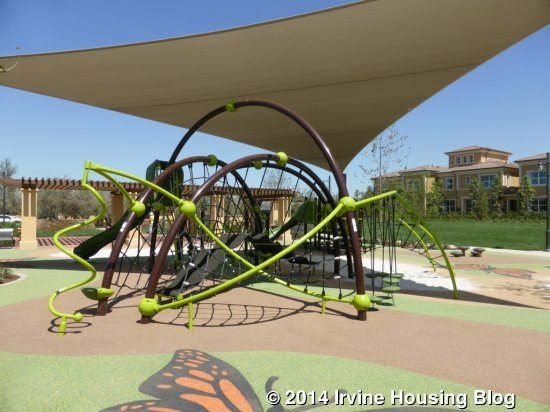 The colors of the structure, the painted butterflies on the ground and the bug-like appearance of some of the climbing zones really tie the park into the natural environment. Like Orchard Vista, this park has a mostly rubber play surface with some sand. Inside the gates, there is a Junior Olympic-sized pool, a wading pool, and a spa, along with additional tables and shade structures. There are separate bathrooms for the playground and pool areas. Orchard Terrace Park is also home to a nice multi-purpose room for community use. Because parts of Orchard Hills opened several years ago, the area already has an established shopping center located at the corner of Culver and Portola. The Orchard Hills Village Center houses a Pavilions and CVS, several restaurants (including Zov’s and La Sirena Grill), plus a bank, salon, yoga studio, and much more. Residents can also enjoy Settler’s Park, which opened several years ago. In addition to the playground, the park has picnic tables and barbecues, basketball courts, a sand volleyball court, and soccer fields. Settler’s Park is located just outside the gates to the Groves and just below Orchard Hills School. 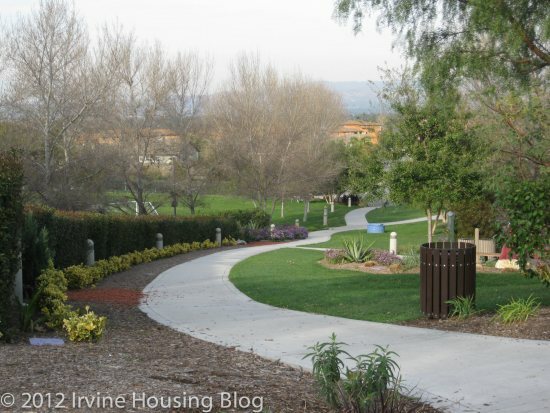 For those looking to experience nature, Orchard Hills boasts paths that weave along the avocado groves and trails that lead to open space around Loma Ridge. The trail is only open during scheduled, docent-led activities. Its double loop offers a 1.2 mile lower loop trail for beginners and 3.1 mile upper loop for more advanced hikers. On the trail, hikers can discover wildflowers, native birds, Eucalyptus trees, and enjoy panoramic views (including the ocean and Catalina on clear days). The elevation starts at 400 feet and ends at 815 feet if you take the upper loop. Docent-led activities include a sunset hike, full moon hike, morning nature hike and a cardio hike. I am looking forward to touring the different home collections and reporting back in the coming weeks. I will also go inside the gates of the Groves to tour their resort area and provide a community overview. This entry was posted in Community Profile on June 10, 2014 by Karen. What's Happening with Orangetree Estate? Previously, I took a look at the condition of the real estate market in Irvine’s most expensive housing market, Shady Canyon. That was the highs; today it’s the lows. 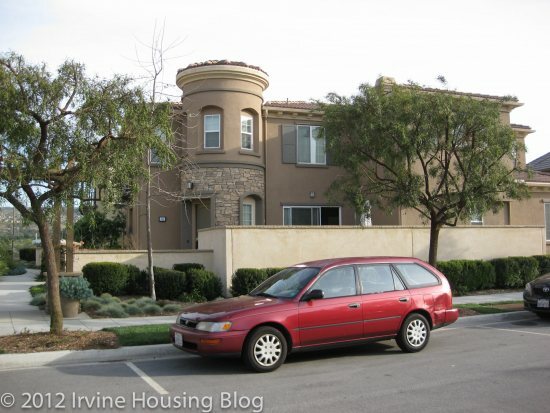 In other words, today I will write about one of Irvine’s most inexpensive housing markets, Orangetree. Orangetree is in the 92618 ZIP code. This contains the Oak Creek, Stonegate, and Portola Springs neighborhoods as well as the planned Great Park neighborhoods. Therefore, the price of homes in this ZIP code varies greatly. 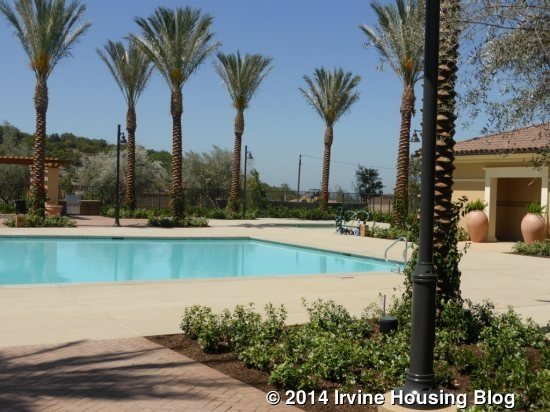 Orangetree is the most affordable neighborhood in this ZIP as well as in much of Irvine. 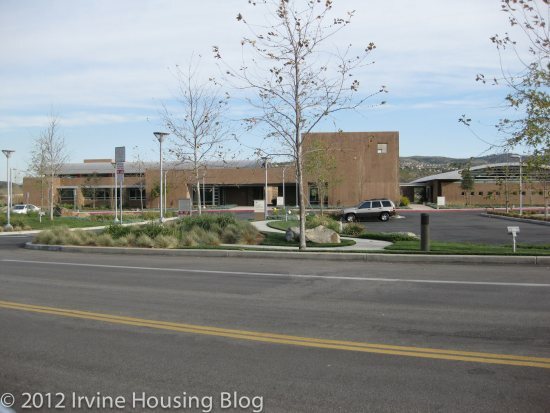 In spite of being one of Irvine’s most affordable communities, Irvine’s most recent housing element grades the condition of housing in this area with an A. The housing element concludes that this may be due to the existence of the homeowner’s association, which has fees range from approximately $200 to $350. 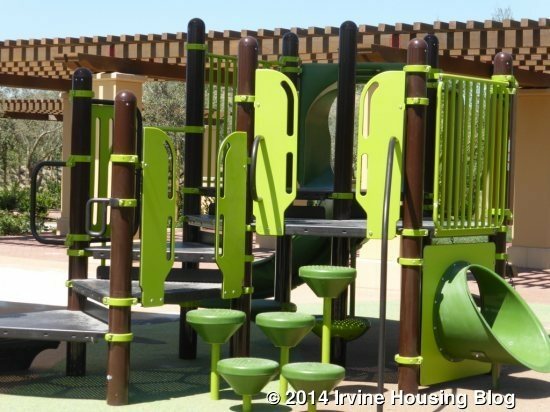 Orangetree is located near Irvine Valley College, Irvine Spectrum, the Irvine Metro train station, and Oak Creek Golf Course as well as the Orange County Great Park. According to Redin, 6 locations in Orange Tree currently have homes on the market. This is in addition to numerous sales that are pending. Orange Tree homes range in size from about 500 square feet to about 1200 square feet. The small number of square feet is a big contributor to the relatively small price. As the chart below shows, most Orange Tree homes are condos. The median list price of Orange Tree homes is $216,000 or $252 per square foot. Redfin stats show that 5 homes sold in January 2012. The median selling price for these 5 homes was $205,000 or $249 per square foot. This median selling price per square foot is down 4.2% from the previous month and down 13.5% from the previous year. An Orange Tree home listed near the median price per square is at 405 Tangelo. This 1983 condo has 2 beds and 1.75 baths with 1,051 square feet. It’s listed for $258,000 or $245 per square foot. 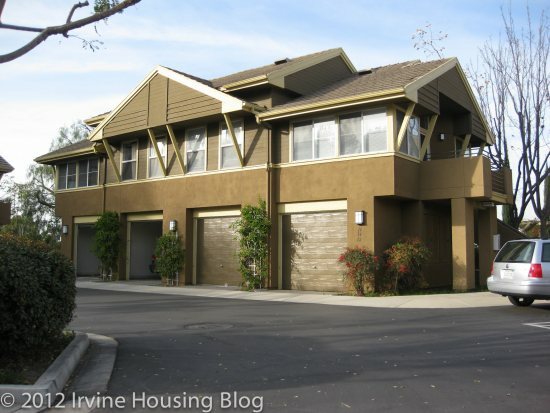 The HOA fees are $298 and $19 per month. The highest priced home in this market (excluding sales pending) is at 22 Tangerine. 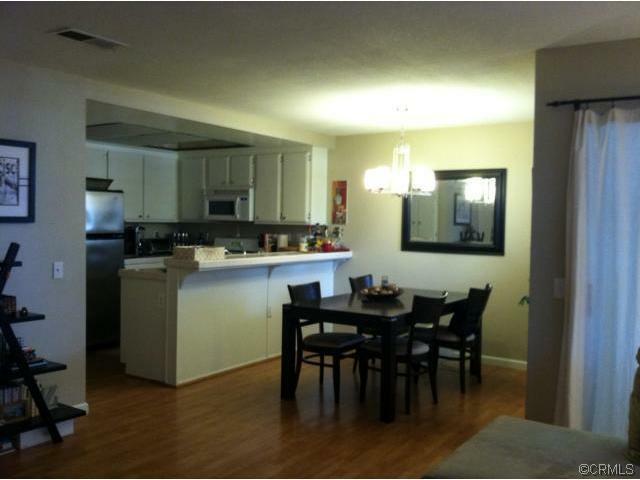 It’s a 2 bed and 1.75 bath single-family home with 1,202 square feet and an attached garage. The list price is $359,305 or $299 per square foot. The HOA fee is $186 per month. Redfin stats also show that this home was listed for $425,000 in September 2011. After this date, the list price went on a roller coaster ride with the price being lowered and raised various times until it was listed at the current price of $359,305. According to Zestimate, the value for this home has decreased by $12,000 during the last 30 days. The current Zestimate of this home is $346,100. The Redin listing in Orangetree with the least expensive price tag (excluding sales pending) is 42 Orange Blossom. It’s a 1 bed and 1 bath condo with 717 square feet and a carport. The list price is $161,500 or $225 per square foot. The HOA fees are $280 and $20. This home sold for $201,000 on May 29, 2003, and according to Zestimate, the value of 42 Orange Tree has increase by $2,000 in the last 30 days. The current Zestimate is $168,900. Now we’ve had a tour of the highs and low in Irvine real estate. Maybe next time I’ll write about the in-betweens. We’ll see. This entry was posted in Community Profile on March 6, 2012 by Sylvia Walker. 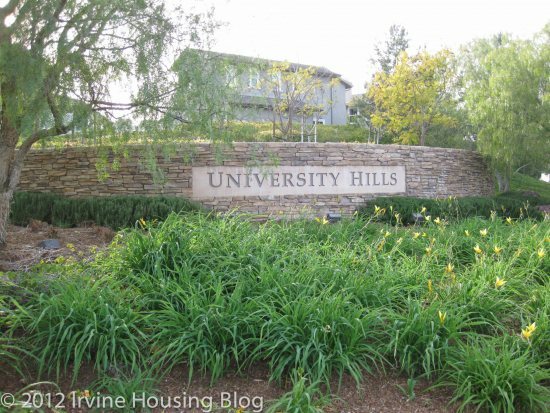 University Hills is the University of California, Irvine's campus housing community for individuals holding full time employement at UCI. Seeing some of the homes in University HIlls from Bonita Canyon makes me want to get a job at UCI. Part of the appeal is that it's kind of exclusive. 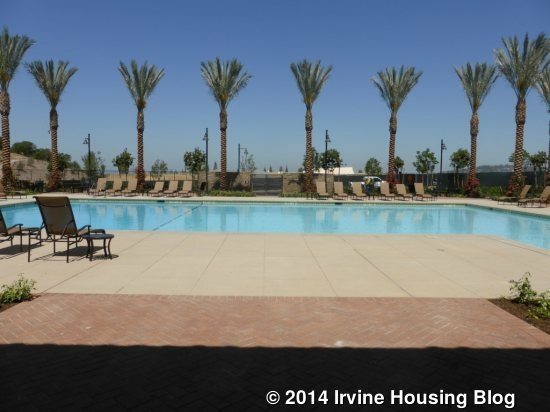 It's not like other parts of Irvine where (as long as you have enough money), you can buy or rent in any neighborhood. The other draw is that the homes are so said to be much more affordable than their equivalents down the street in other parts of Irvine. 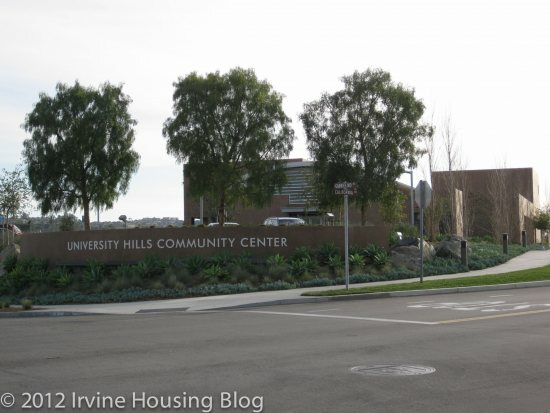 According to the Irvine Campus Housing Authority website, “University HIlls…is generally regarded as the most successful on-campus housing program of its kind in the country.” It is an academic community in residence to provide affordable housing to eligible full time employees of the University of California, Irvine. University HIlls is located on the South end of campus, and is bordered by Anteater Drive, Los Trancos Drive, Gabrielino Drive, Vista Bonita Drive and California Avenue. 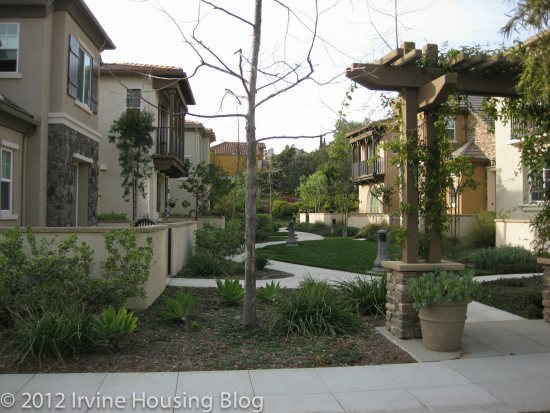 I took a drive around University HIlls and like many neighborhoods in Irvine, I saw manicured landscaping, lovely parks, nicely kept walking paths that were well lit for evening strolls, young children on the street playing, and of course, seemingly close together homes with little to no yards. There really were some nice paths to walk on, accompanied by sitting areas with vista points providing views of Turtle Ridge, the University, most of Irvine and beyond and the airport area. Children who live in University Hills can attend University Montessori, Turtle Rock Elementary, Rancho San Joaquin Middle School, and University High School, though only the Montessori is within short walking distance. 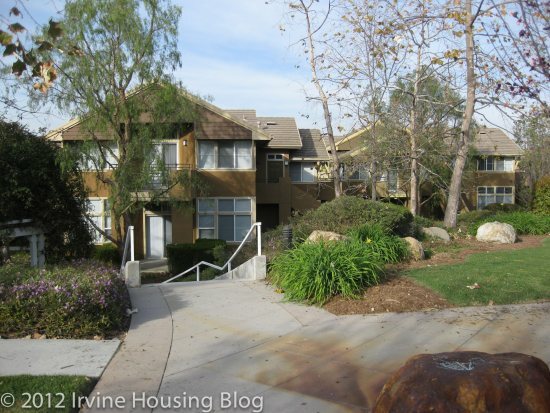 All homes in University Hills are located on lots OWNED by The Regents of the University of California and are LEASED by the Irvine Campus Housing Authority. Homeowners then essentially SUBLEASE the land upon which their home sits. According to documents on the site, subleases are long term and end in 2082. The ICHA gives three payment plans to pay land leases. You must try to sell to the University, the faculty or staff when you decide to sell. If you can't sell within a specified (?) period of time, and the University doesn't exercise its option, you may sell your home to a member of the general public. That person would be subject to the same terms. My guess is that there's pretty much always faculty or staff that is interested in buying the homes in University HIlls and if by chance a home did not sell, the University would buy it temporarily. Resale prices of homes are restricted. Ground Sublease indices control pricing in University Hills with the intent to provide affordable housing and to prevent the homes from serving as speculative investment vehicles. Get outta here, flippers! If the circumstances of employment with the University change, you may no longer be eligible to own in University Hills. 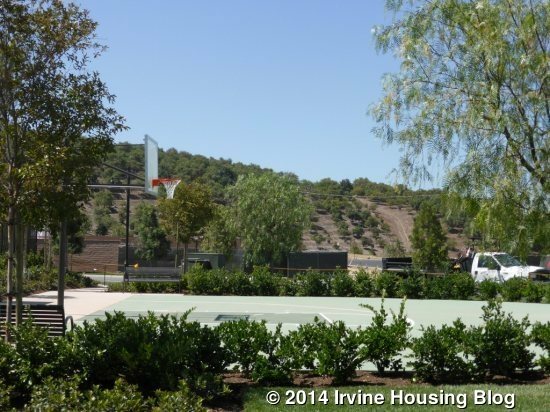 Currently, new homes are under construction off of Gabrielino. 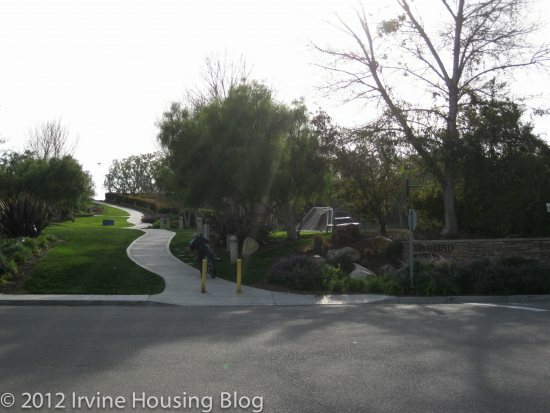 Because the homes have been constructed over the last 25 years, it's an interesting mix of homes within the area of a typical village in Irvine. The older ones are much like what you'd see in Woodbridge and as the styles in Irvine changed over the years, so did the styles with University Hills. You can see the various floorplans here. Of course, the homes are somewhat cookie cutter and any exterior changes must be approved by the ICHA. 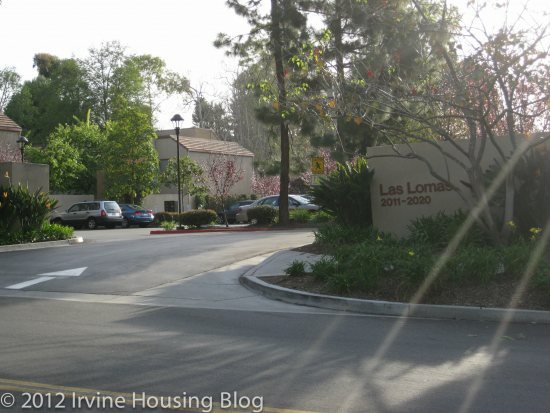 Las Lomas Apartments – 2-3 bedrooms with 1-2 baths. These units are between 970 and 1200 sq ft and cost $1290-$1590 per month. Priority is given in the same sequence as the home sales above and faculty, academic and University staff are eligible to stay up to 5 years. Not cheap! Do any of you live in University Hills? What do you like about living there? Any drawbacks? What's it really like? What do taxes, home owners association dues (or their equavalents), etc add up to? Anyone know how much these homes actually sell for? This entry was posted in Community Profile on February 22, 2012 by nilam. 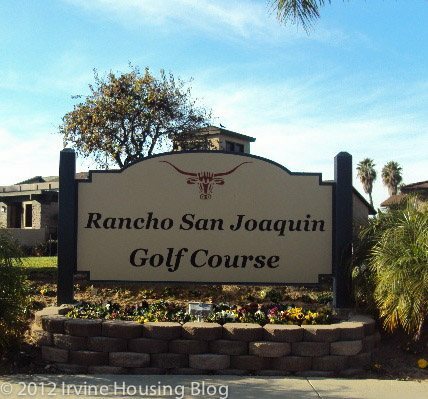 The village of Rancho San Joaquin is a quiet community that provides a nice escape from the nearby commercial area. It is surrounded by Culver Drive, Michelson Drive, University Drive, and Harvard Avenue. It is right around the corner from the Culver/405 interchange. Rancho San Joaquin offers a generous amount of trees that line the streets which is nice since it gives this neighborhood a rural feeling. Even though I personally don’t play golf, the golf course also adds to the visual appeal of the neighborhood. 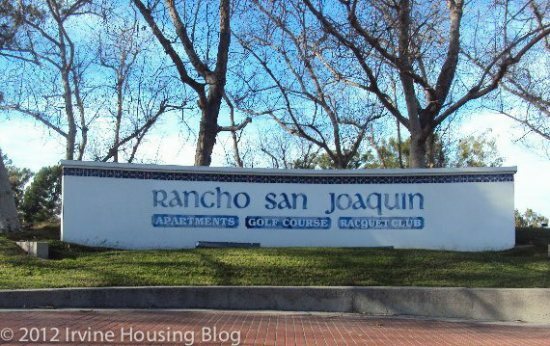 Condos and apartments are prevalent in the Rancho San Joaquin neighborhood, including the Rancho San Joaquin apartment homes. The overall curb appeal of the majority of the homes is mediocre. They definitely reflect the time frame which they were built; the 70’s and 80’s. However, most of the landscapes are neat and well-kept, which at least heightens the overall appeal of the neighborhood. The prestigious University of California, Irvine is only a few miles away; as are many high ranked grammar and middle schools. The Rancho San Joaquin Golf Course adds some nice scenery, as well as serving as a barrier from the nearby city. 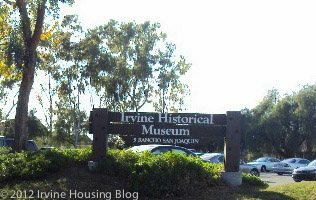 And if you’re interested in history, the Irvine Historical Museum is directly to the left of the entrance of the golf course. What makes this museum interesting is that it was originally the first wooden house built between Anaheim and San Diego. Even if you don’t like history…at least the house adds a little character to the neighborhood. There is a senior center, where they have educational classes throughout the week. Or, if you’re in need of a ballroom or multipurpose room for any particular reason, they’re available for rent. Not particularly useful on a regular basis, but at least its there if you need it. But, given the outdated architecture, I’m willing to bet the interior isn’t much better. 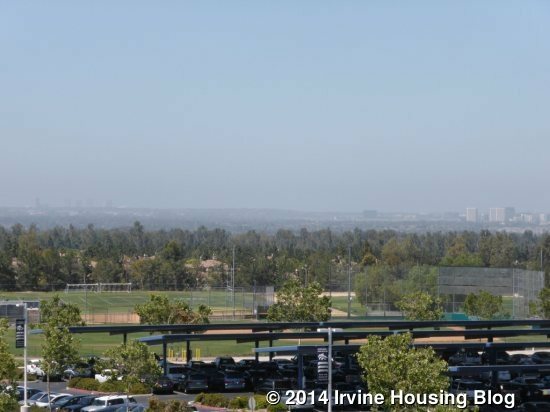 Right behind the senior center, is the Racquet Club of Irvine. They have tennis courts, tennis lessons, tournaments, a swimming pool, a restaurant, etc. If you enjoy tennis, and can spare the extra cash, it’s actually pretty nice. 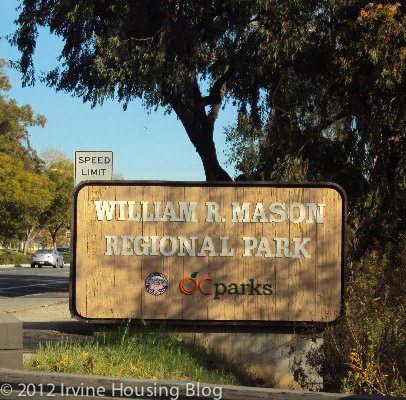 Just on the other side of University Drive, is William R. Mason Regional Park, which has an endless amount of shade trees, a 9-acre lake, bike paths, and even model boat sailing. While it would be nice to have this so close to your house, the only downfall is that you actually have to pay in order to get in. And even though this is a very beautiful park, there are many free parks nearby. All in all, this neighborhood isn’t too bad. It’s close to the freeway, there are nearby shops, and the prices of the houses are relatively decent, considering how expensive Orange County is. I think I would sacrifice the visual appeal of the architecture for a home in this neighborhood. This entry was posted in Community Profile on February 8, 2012 by zovall. Wendy Larson has lived in Irvine for over twelve years. She graduated from Woodbridge High School, took some courses at Irvine Valley College and eventually graduated from Penn State University as the Student Marshal with Highest Distinction. After graduation, Wendy was awarded a teaching assistantship in the South of France. After a year of working abroad Wendy moved back to Irvine. She is currently a Senior Operational Trainer at a health care company in Costa Mesa. Wendy spends her free time writing, public speaking and mentoring individuals looking to improve their speaking skills. 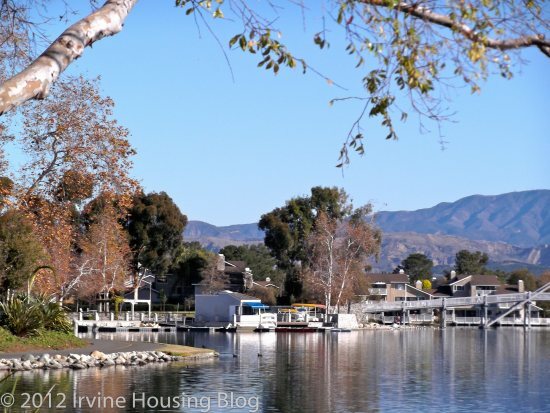 Located in one of the most picturesque areas of Irvine, Woodbridge Village offers distinct housing communities, charming views and an atmosphere that appeals to families, couples and singles alike. 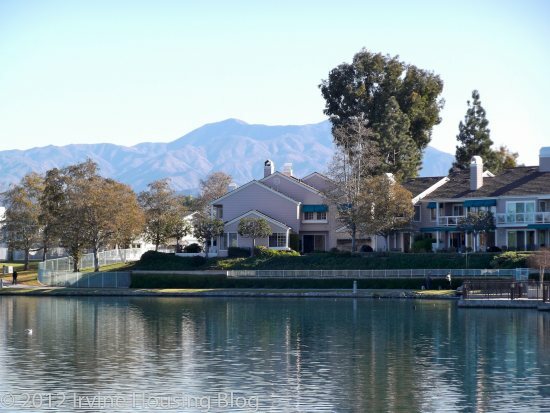 Nestled between the major streets of Jeffrey and Culver, and intersected by Barranca Parkway (North Lake) and Alton (South Lake), Woodbridge Village is situated around two gorgeous lakes and is convenient to all community amenities. The residential communities consist of a mixture between single family residences, condos and apartments. Take a drive on East Yale Loop and West Yale Loop to get a scope of the residential neighborhoods within Woodbridge Village. 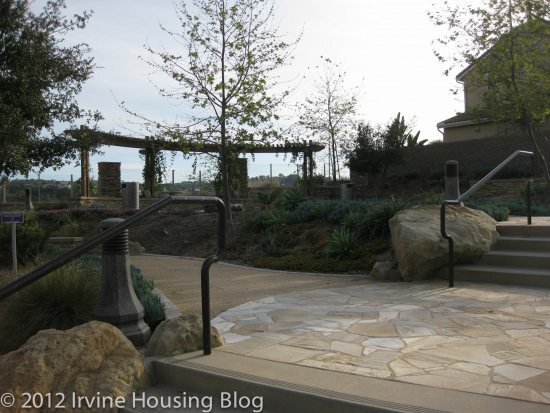 This area is intrinsically unique in look and feel from the rest of Irvine. Much of the community is maintained by the Woodbridge Village Association, to which residents must pay homeowner’s association dues. The Association owns and operates 41 recreational facilities and does a great job ensuring these facilities are clean and well landscaped for all to enjoy. The area has a close proximity to dining, shopping, parks, and athletic fields. Dotted along Barranca Parkway are major shopping centers, including the Woodbridge Village shopping center, The Crossroads, Woodbridge Square and the District at Tustin Legacy. If you’re looking for entertainment, dining and shopping in one spot, Woodbridge Village is just a hop, skip and a jump away from the nearby Irvine Spectrum. If education is your top priority, Woodbridge Village is within walking distance to Eastshore Elementary, Stone Creek Elementary, South Lake Elementary, Meadow Park Elementary, Lakeside Middle School, Woodbridge High School and Irvine Valley College. The Woodbridge Village shopping center also offers extracurricular educational facilities including Kumon Math and Reading Center, Mission: Renaissance Fine Arts Classes, and Aloha Mind Math. The most popular attractions of this region are the North and South lakes. Two bridges, one spanning across Alton and the other crossing Barranca Parkway, link together the pedestrian access to both lakes. Enjoy the mountain backdrop as you relax in the gazebo on the lake, and watch the children feed the ducks. Or, grab a window booth in Ruby’s Aqua Diner and enjoy a meal while gazing over the water. If fitness is on your agenda, you’ll appreciate how the layout of the community encourages exercise by providing bike trails where cyclists and joggers can enjoy a pleasant and safe route through the neighborhoods. CorePower Yoga offers day, night and weekend classes for beginners to advanced yoga enthusiasts. And of course, nearly all major gyms are within fifteen minutes driving distance. 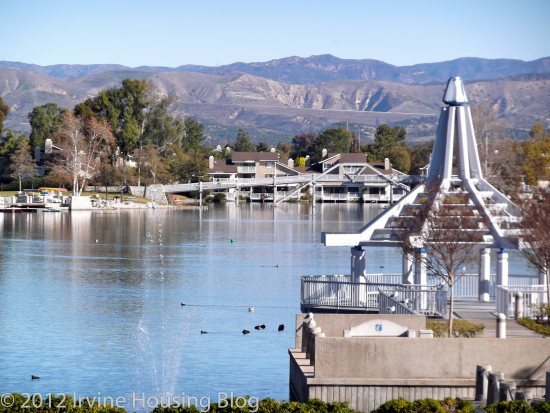 With its convenient location, stunning views, and alluring housing, it’s worth giving Woodbridge Village some consideration if you want to buy in the city of Irvine. If you’re thinking it seems too good to be true, you may want to scope out the area to see if it’s right for you. Let me point out a few things you may want to consider should you decide to take a deeper dive into the community. The oldest parts of Woodbridge date back to the 1970s, and it is obvious the housing is more dated than the rest of Irvine. The majority of Woodbridge Village was designed to reflect the New England Cape Cod style, which is visually prominent in the housing tracks bordering the lakes. But let’s be honest here folks. This is not Cape Cod, nor does it feel like Cape Cod! You can only pull off the Cape Cod style on the East Coast. It doesn’t belong in Orange County. California has its own coastal flair. We are deeply rooted in a contemporary look and feel, which the newer communities celebrate. 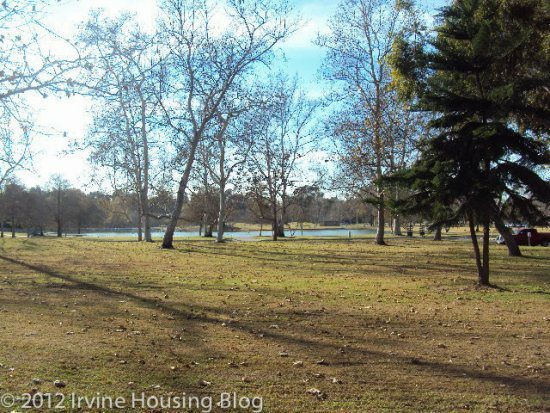 The early architects of Irvine may not have fathomed the growth and development of the planned communities that currently populate the city. The California stucco and neutral color palette that characterize the newer housing and retail developments make Woodbridge Village stick out like a sore thumb. Because of the change in aesthetics, Woodbridge Village seems old. The Woodbridge Village shopping center is drab. 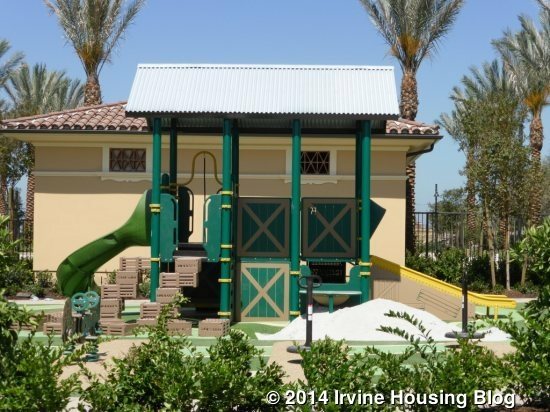 It’s one of the few timber constructed centers in all of Irvine. The wooden shingle exteriors and deeper paint colors make the center seem dark with too much shade. Other than Ruby’s, Stein Mart and Barnes & Noble, there aren’t any big name retail draws. Sometimes I wonder how these businesses keep their doors open. Ten years ago it used to be full of boutique style shops, but newer strip malls attract more crowds and the center is now home to more medical offices rather than stores. While the Woodbridge Village shopping center contains a movie theatre, the movies are several months old and have already cycled through the regular circuit. By the time the movies reach the Woodbridge Village theatre you’ll have read the reviews online or have gotten the Cliff’s Notes version from your kids. There is a sandbox area with over-sized concrete frogs that the kiddies can climb on, but let’s face it, with awesome lakes flanking both sides of the center the frogs seem a little lame. I don’t want to paint the wrong picture of the center. It’s a nice center to walk through and relax in. I just think the whole center, much like Woodbridge Village, needs an overhaul or at least a facelift. There are additional areas that need some love. The scars of failed businesses and empty buildings give the area a depressive feel. For example, the Waters Restaurant is now an empty shell sitting on the lake. With its premium location, the restaurant was once an impressive dining experience. Currently it’s boarded up. A razed gas station surrounded by a chain link fence in the parking lot of the Woodbridge Village shopping center, is an eyesore. The timber constructed Bank of America has packed up shop and the space is now inhabited by a less well-known credit union. Then there’s the dark wooden shingle Wachovia building. It looks like it’s sagging. Maybe it’s because Wells Fargo bought them out. Other areas look downright deserted. Some people might call the neighborhoods quiet. Others would describe it as a reminder of tough times. I think that if retail traffic increased and if the buildings could be updated, Woodbridge might have a fighting chance. The truth is however, that Woodbridge Village has been overrun with medical offices that cater to the nearby retirement community. It would be hard to restore it. Woodbridge Village is still a wonderful community to live in. Just because it’s an older community doesn’t mean it lacks charm. My advice: look at the big picture and decide if Woodbridge Village matches your preferences. This entry was posted in Community Profile on January 23, 2012 by Wendy Larson.